A electrician, who tampered with a prepaid electricity meter has been detained by Capital police in Chimpu. The police here today detained one Gangadhar Anurag in connection with the tampering of the Pre-Paid Energy Meters (PPEMs) in the Water Resource department complex, Chimpu here. Anurag, who is an electrician of the Water Resource department (WRD), was detained by the police following an FIR, lodged today by the Executive Engineer (E) Capital Electrical division, department of Power. 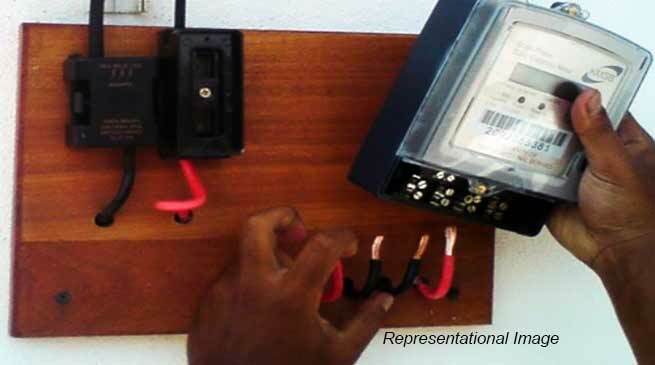 The Capital Electrical Division executive engineer (E) Joram Lali in the FIR stated that Anurag has been caught red-handed in his illegal act and that he also tampered PPEMs installed at the residents of Sangey Laden State Sports School at Chimpu. He added that Anurag has been found to be instrumental in releasing illegal service connection activities in and around WRD complex and in many locations in Chimpu area. He also informed that another private electrician Liladhar Padu who resides near Chimpu bridge has been found to be Anurag’s close accomplice and that both have been carrying out the illegal activities. Lali said that the duo has been tempering and bypassing PPEMs, releasing unauthorised service connections, tempering electrical installations, causing damages to the electrical systems, causing inconvenience to the other esteem consumers, and untold difficulties and miseries to the officers and officials of the department of Power, while discharging public service. ‘The worst part of their illegal activity is that it resulted in leakage of huge government revenue which may be ranging from lakhs to crores of rupees to the state exchequer,’ read the FIR. Meanwhile, Itanagar PS OC T Bage informed that as of now they have detained Anurag under the charges of theft and that efforts are being made to apprehend Padu also.